What would be most bride’s fantasy/ideal wedding, if asked? Getting married on a beach, with the sand between their toes, must be top of the list. Well, why not make your fantasy come true! Cyprus has many stunning beaches that you can now hold your civil wedding or blessing or renewal ceremony on. The beautiful idyllic Ayia Triada beach, which is part of the Paralimni Municipality, is one of the newer beach ceremony venues, and, will probably soon be one of the most popular choices. 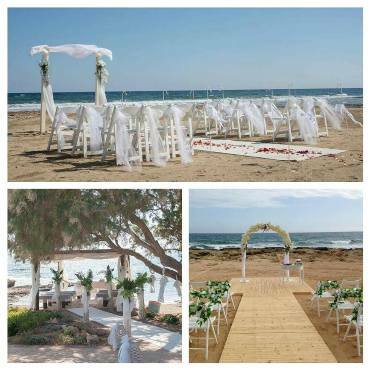 Another popular beach wedding ceremony venue is Ammos Beach in Ayia Napa, or as its proper name is Ammos tou Kampouri beach. With a beautiful view of the Mediterranean, this is one of the most popular venues in Cyprus, at the moment. Lastly, Ayia Thekla beach is another popular venue with brides at the moment. With 2 separate areas on this beautiful stretch of sandy bliss to choose from, there is something for everyone.